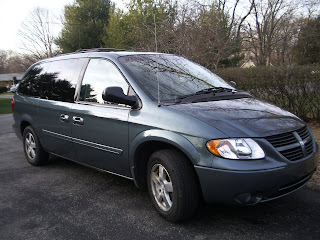 that we were to become a mini-van family. Our explorer was great looks-wise, but it was not the greatest on gas mileage or kid-friendliness. It wasn't the easiest loading all three boys into it, plus--we had no additional room for anyone to ever come with us in our car! Since my mom is around quite a bit, and for the other reasons mentioned above, the explorer was just becomining more and more impractical. 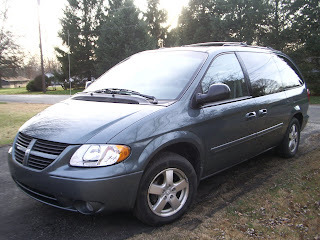 So, several months ago, we began the process of starting to search for a mini-van. We looked, and priced, and even test-drove, but never came to one that we knew was "it." Enter Shane's Aunt Deanna and Uncle Alan, who live in Missouri and just so happened to own a 2006 Dodge Grand Caravan (exactly the model we knew we wanted, but newer, nicer than we thought we could afford, and with less miles!) When we went down in August and Deanna mentioned that she was getting a new car with her job and this one was on the market.....we couldn't believe our ears! Jump ahead three months, and you find the Merritt family proudly driving this very mini-van. It is great, and we loved it from the first time we drove it! 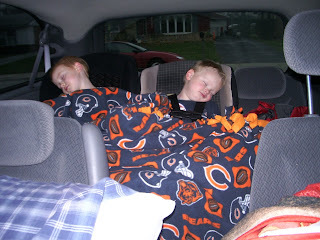 This picture is of Colin and Cameron, on the way home from Thanksgiving (Alan and Deanna so graciously drove the van from Missouri to Chicago for us so that we would not have to go and get it--thanks so much both of you!). You can't see Ethan; we originally had him in the seat right behind the driver, but we have already moved him to be back with the other two boys, and have stowed both of the middle seats. It is so easy to manuever around in, and has so much room. We are so fortunate that God worked all of this out for us, to be able to get this nice of a van at the price we did was, quite literally, close to miraculous, and we are so grateful! Isn't family great! We have a very similar story with our mini van. My brother and sis in law got a new one and called and asked us if we wanted their old one for the trade in price! (We too had thought about it - priced them and said WOW - maybe in a few years) so this worked out PERFECTLY. We were able to sell Gary's car and buy theirs so it is paid off. PS- Yours is really pretty! 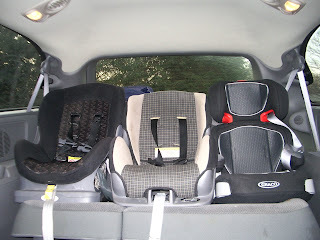 I like the three car seats in the back. You crack me up with all those seats in the back--I don't dare do that :) BUT rest assured, when we went to have the car seats checked (before Jaden was born) they said the safest seat in a mini van is the back seat!!! we also have a dodge caravan and LOVE IT!! Congrats and welcome to the "soccer mom" club! !